All together, we've been at this book writing thing for quite a while now. We've authored, co-authored, revised, or contributed to more than 40 titles over the last 15 years. 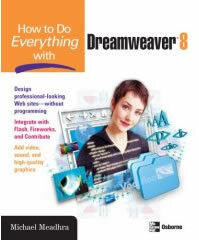 Our latest full-length book is How to Do Everything with Dreamweaver MX 2004. Despite the title, this isn't one of those 1500-page doorstops that explains every detail of the program in excruciating detail. Instead, it attempts to address the information that the average Dreamweaver user needs to know to work effectively with the leading web development program on the market. It's simple enough for most beginners, but packed with more intermediate-level content than most "beginner" books. You can purchase the book from Amazon, Barnes & Noble, or direct from the publisher, Osborne/McGraw-Hill. The new version of Macromedia Dreamweaver is now available, so it's probably no surprise that there's a new edition of How to Do Everything with Dreamweaver in the works as well. It's on the press now and you can pre-order the book at Amazon.